For me, there is nothing quite like seeing a dog enjoying the water. Their sheer exuberance is a joy too see, never mind that it is excellent exercise for them. But here’s the thing — this should not be something forced upon a dog. I mention this because, over the past few days I have seen a number of dog owners getting this horribly wrong. When the weather is fine, Ziggy (pictured) and I regularly go swimming in the river, often with other dogs and Sue (my better half) looking on, somewhat bemused. Ziggy would not go near the water a couple of months back (when she came to us from a rescue centre). By encouraging her, very gently, by entering the water myself, Ziggy started paddling, as she grew in confidence she has transformed into a canine version of Mark Spitz! Yesterday, I saw, yet another example of how not to do it. A couple (late 40s) with their Cockapoo (maybe 9–10 months) came to the place where Ziggy and I were romping in the water. On seeing this, he tried to force the dog into the water (he was more concerned in getting it clean — not interested in some fun for the dog). 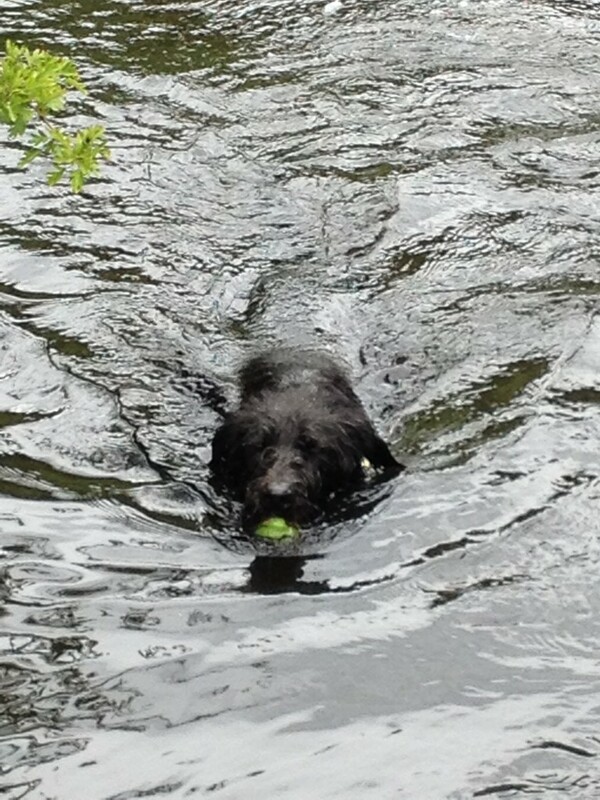 I encouraged the pup into paddling depth with a ball — he thought this was huge fun. The owner, driven by his need to ‘clean his dog’, regardless that the water was doing that already — grabbed the dog and forcibly ‘washed it’. Result, the dog became nervous and would no longer enter the water. This fool also informed me that he had thrown the dog into the sea — yep, that’ll work. From a behavioural point of view, this little episode demonstrates a staggering lack of understanding how a dog thinks. The poor puppy, obviously quite keen to play in the water, had his fun turned into an unpleasant experience through the forced ‘washing of him’. This type of owner behaviour is a surefire way to turn your outgoing puppy into a nervous dog, afraid to do some the the most fun things. So, think before you do anything to cement a fear in your dog, as a direct result of what you do.